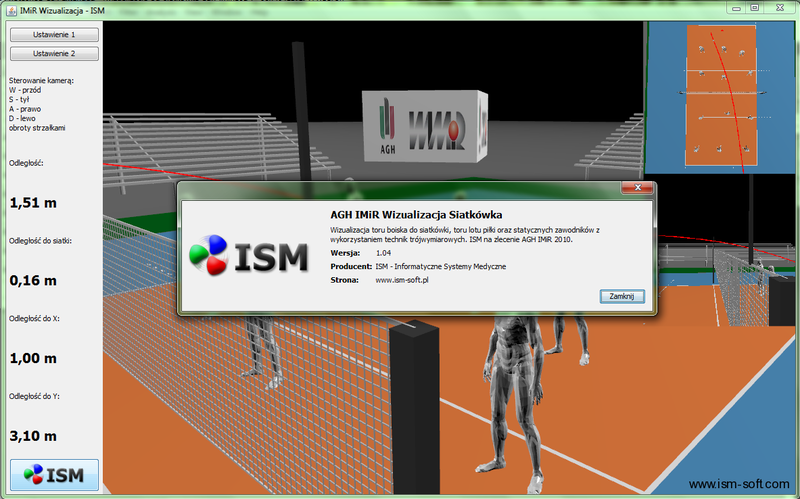 3D Visualization of trajectory of the ball on volleyball court along with it’s surrounding has been prepared by ISM for AGH University of Science and Technology in Kraków, Faculty of Mechanical Engineering and Robotics. 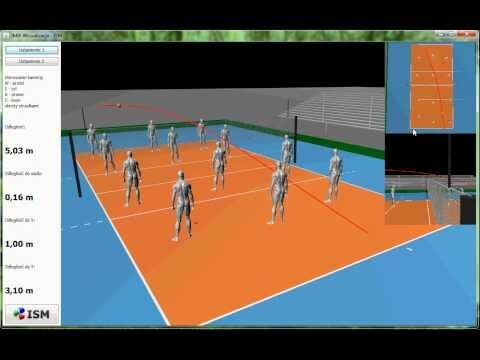 PC application allows you to visualize the ball flight path, volleyball court and static players, with the use of three-dimensional techniques. It also allows you to save setting of players in the formations, illustrative projections of the pitch and reading the coordinates from these projections. The application window has been designed to simplify the use of applications on different devices as much as possible. 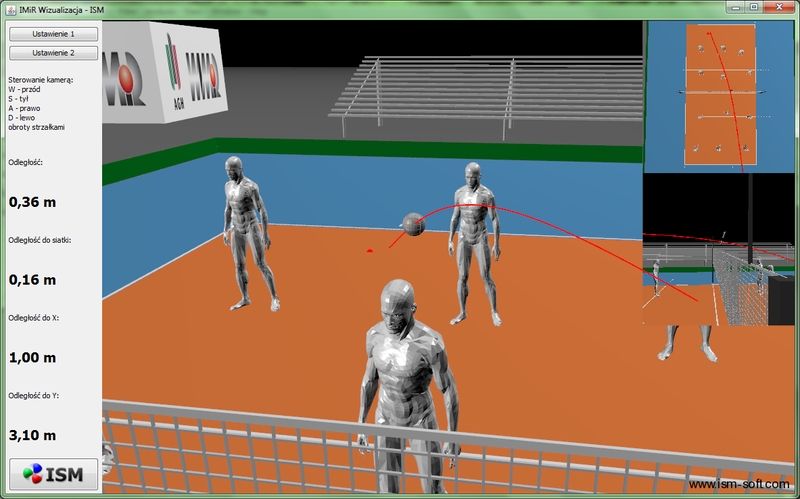 The main section of the window holds a 3D animation showing the actual view of the pitch and additional cameras from top and side. In the left part of the application window is a simple control panel, which presents the results of calculations. The main part of the panel with a view of the model of the field contains the pitch with a simple surraundings. 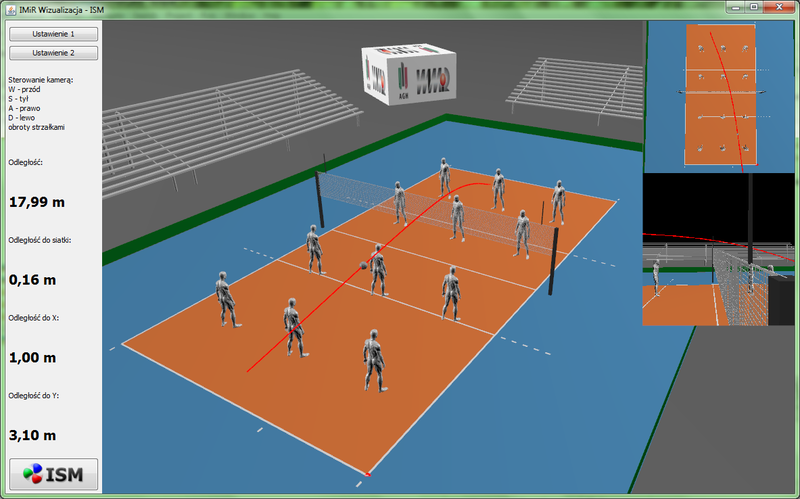 Visualization also includes the static models of players and a view of the ball trajectory (red), over which the ball moves. 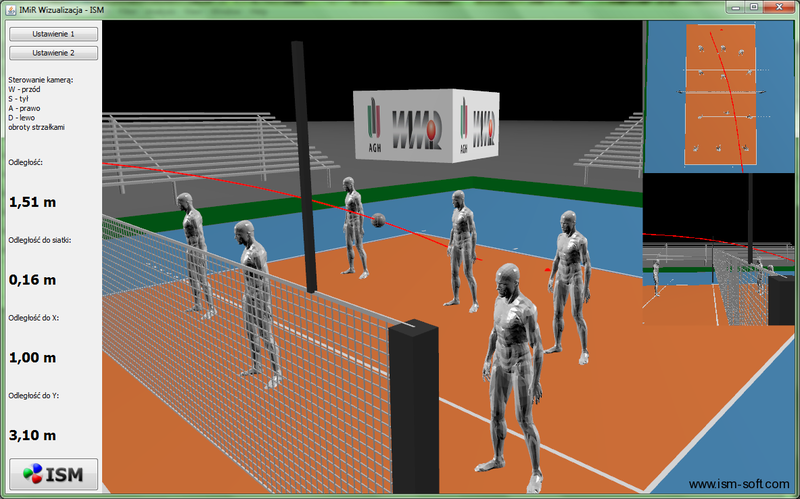 In the upper right corner there is a current picture of the camera placed directly above the pitch. 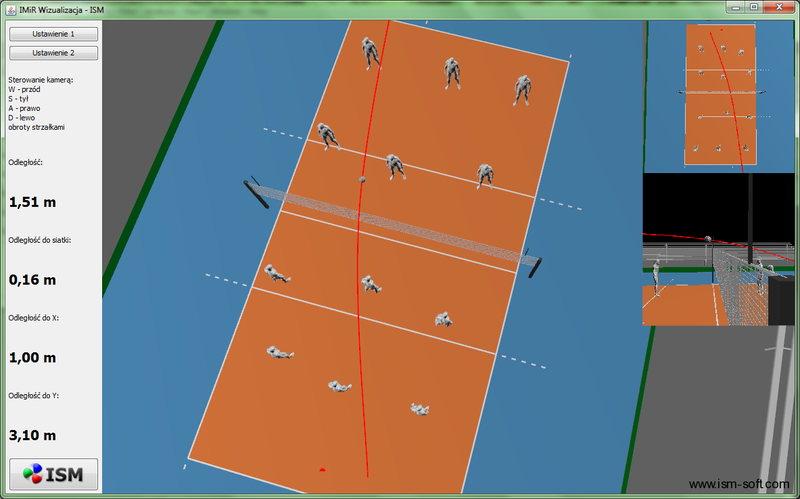 Under it there is a view from the camera placed at the side of the pitch, at the net. 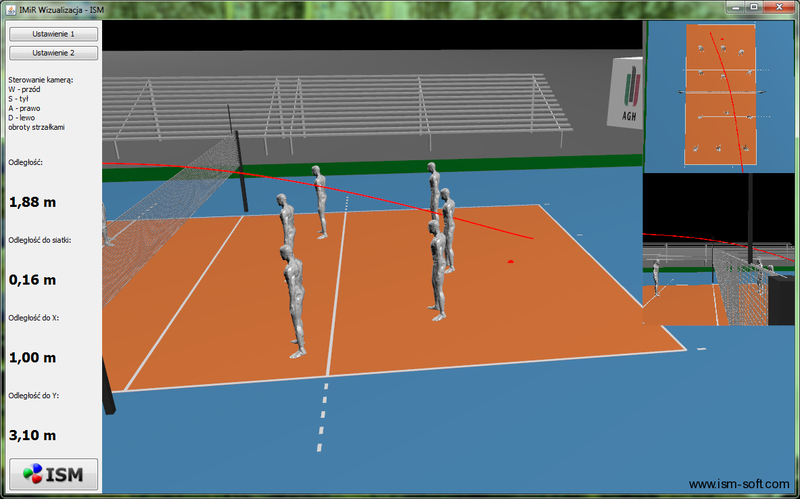 In the main part of the panel with a view of the pitch user can also select a point on the field. User can select it with the use the mouse. Marked point is used to calculate the distance displayed on the control panel. 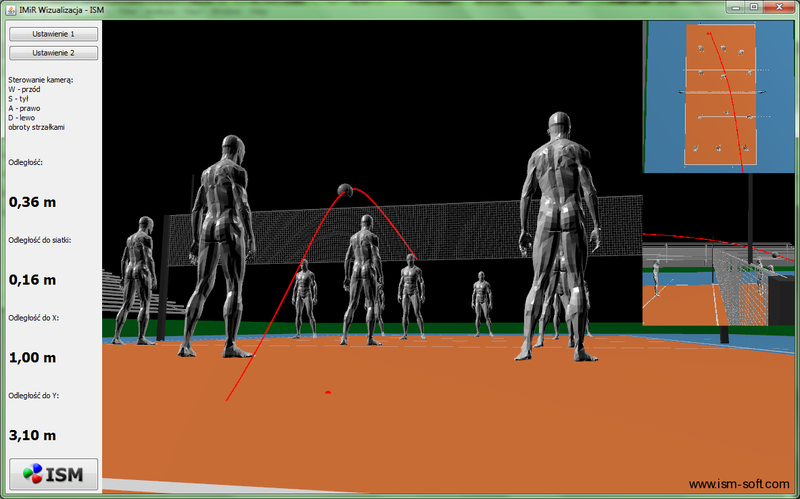 Setting of the curve representing the trajectory of the ball takes place through the points loaded from an external file.